Summary: Difference Between Groupware and Email is that Groupware is software that helps groups of people work together on projects and share information over a network. Groupware is a component of a broad concept called workgroup computing, which includes network hardware and software that enables group members to communicate, manage projects, schedule meetings, and make group decisions. While E-mail (short for electronic mail) is the transmission of messages and files via a computer network. Today, e-mail is a primary communications method for both personal and business use. Groupware is software that helps groups of people work together on projects and share information over a network. Groupware is a component of a broad concept called workgroup computing, which includes network hardware and software that enables group members to communicate, manage projects, schedule meetings, and make group decisions. To assist with these activities, most groupware provides personal information manager (PIM) functions, such as an electronic appointment calendar, an address book, and a notepad. 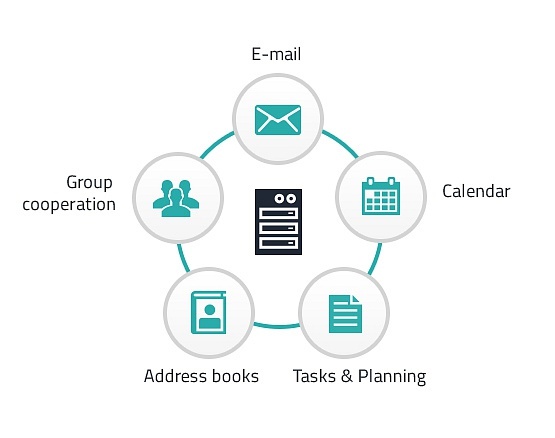 A major feature of groupware is group scheduling, in which a group calendar can track the schedules of multiple users and help coordinate appointments and meeting times. E-mail (short for electronic mail) is the transmission of messages and files via a computer network. Today, e-mail is a primary communications method for both personal and business use. You use an e-mail program to create, send, receive, forward, store, print, and delete e-mail messages. Outlook and Windows Live Mail are two popular desktop e-mail programs. Send an e-mail message using Outlook; Gmail and Windows Live Hotmail are two popular free e-mail Web applications. The message can be simple text or can include an attachment such as a word processing document, a graphic, an audio clip, or a video clip. Just as you address a letter when using the postal system, you address an e-mail message with the e-mail address of your intended recipient. Likewise, when someone sends you a message, he or she must have your e-mail address. An e-mail address is a combination of a user name and a domain name that identifies a user so that he or she can receive Internet e-mail. A user name is a unique combination of characters, such as letters of the alphabet and/or numbers, that identifies a specific user. In an Internet e-mail address, an @ (pronounced at) symbol separates the user name from the domain name. Your service provider supplies the domain name. A possible e-mail address for Kiley Barnhill would be [email protected], which would be read as follows: K Barnhill at e site dot com. Most e-mail programs allow you to create an address book, or contacts folder, which contains a list of names and e-mail addresses. When you send an e-mail message, an outgoing mail server that is operated by your Internet access provider determines how to route the message through the Internet and then sends the message. As you receive e-mail messages, an incoming mail server — also operated by your Internet access provider — holds the messages in your mailbox until you use your e-mail program to retrieve them. Most e-mail programs have a mail notification alert that informs you via a message and/or sound when you receive new mail.